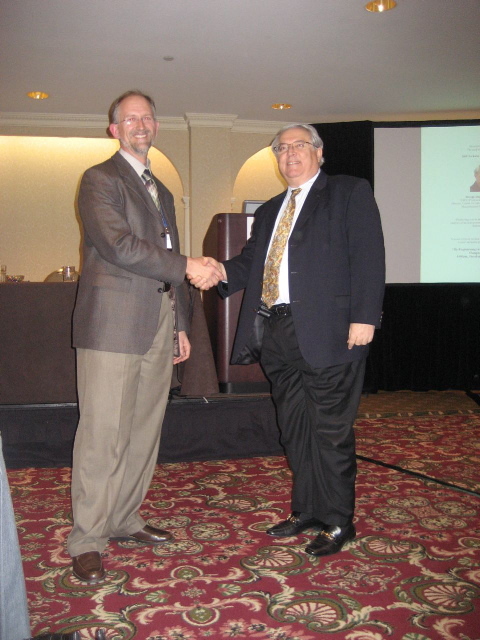 Prof. Mujid Kazimi was recognized with the 2009 THD Technical Achievement Award. Honors and Award Committee Chair Dr. Robert Martin presented the award during the 2009 ANS Winter Meeting. The citation on his award plaque recognizes his "Pioneering role in the fields of design and safety analysis of nuclear power plants, nuclear fuel cycles, and fusion technology." 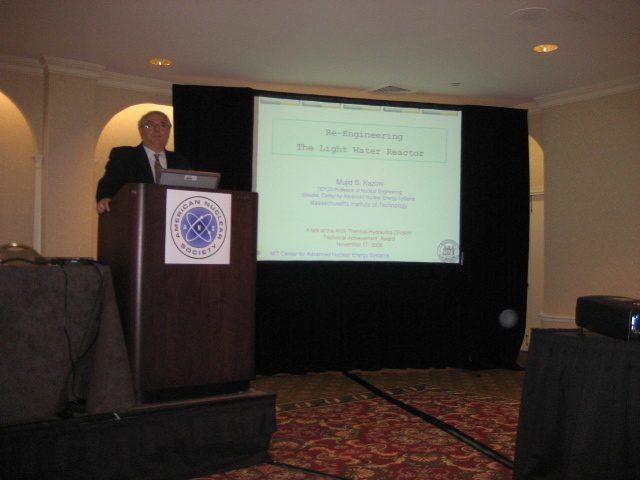 Prof. Kazimi begins his lecture, entitled "Re-Engineering the Light Water Reactor"
Prof. Kazimi received a B.S. degree in Nuclear Engineering from Alexandria University in 1969 and an M.S. and Ph.D. in Nuclear Engineering from MIT in 1971 and 1973, respectively. His professional achievements include thermal hydraulic modeling of liquid-metal fast-breeder reactors (LMFBR); development of heat transfer, interfacial exchange and pressure drop models for the THERMIT code supporting LMFBR applications; development early fusion safety methods including the application of risk-based methods; development of steam condensation models for light water reactor (LWR) and Gen-IV plant condenser and containment applications; and LWR high performance fuels research. He has served on the MIT Nuclear Engineering faculty for over 30 years, including 9 years as department head. He is currently the TEPCO Professor of Nuclear Engineering and the Director of the Center of Advanced Nuclear Energy Systems (CANES) at MIT. Prof. Kazimi is a Fellow of the ANS and the American Association of Arts and Sciences. The 2009 THD Best Paper Award recognized the following technical paper: Bo Feng, Julien Beccherle, Pavel Hejzlar, and Mujid S. Kazimi, "Thermal Hydraulics of PWRs Transitioning to High Performance Annular Fuel" This paper was published in the proceedings of the 7th International Topical Meeting on Nuclear Reactor Thermal Hydraulics, Operation and Safety (NUTHOS-7) held October 5-9, 2008 in Seoul, Korea. Robert Martin presented this award during the same ceremony. 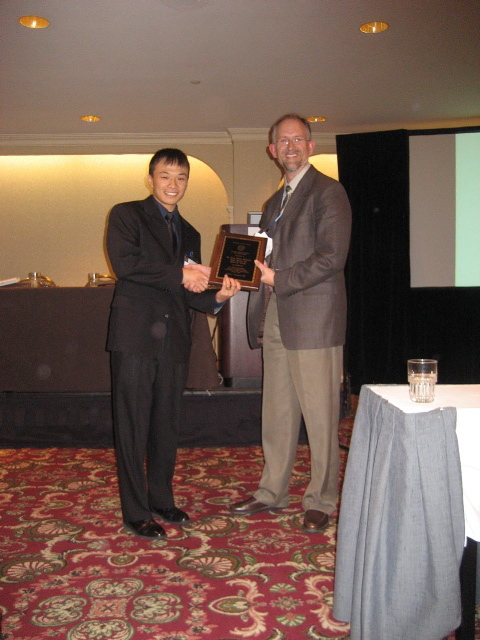 Bo Feng accepts the Best Paper Award plaque from Dr. Bob Martin on behalf of his co-authors.